We have been using web application development process for more than 2 decades now. The web applications were just static html pages at the beginning stage and developers had to change the HTML, CSS and JS code to change the content. The data had to be shared among multiple users and stored at a central location. This led to development in distributed web applications. The distributed applications were capable of providing interactive user experience and web applications provided very limited features. The above diagram represents the architecture of Backbone.js. User requests a file such as a web page, image etc from a web server using HTTP Request protocol. The Backbone routers are used for routing applications’ URLs when using hash (#) tags. A router is required when web applications provide linkable, bookmarkable, and shareable URLs for important locations in the app. It provides methods for routing client side pages and connecting them to actions and events. The DOM (Document Object Model) is an application programming interface which defines the logical structure of documents and the way a document is accessed and manipulated. The DOM sends events to the view. The view objects are associated with a fragment of DOM and constitute the user interface in an application. They are designed to tie models that need to present to the user. View can change as model changes. For information about Backbone.js, just visit the website at the link session. It has OOP design and can be easily extended and overridden. It contains over 100 available extensions. The following is a simple example, which shows backbone view click to display specified message when link is clicked. The example explains how to display the message when we click the link on the output page using Backbone.js. Create main view of the application called App which is bound to the #new form. Create a click event called hello to display the message using alert box. The line var app_view = new AppView initializes the view before loading the message. The view can be attached to existing elements by using el: '#new'. The el stands for element in which, every view has an element associated with the HTML content, will be rendered. This id can be used within an anchor tag which displays the message when user clicks on the link. Save the file as HelloWorld.html in your system. Just open the file in the browser, you will get a link, Click Here, on clicking this you will get an output as in the image below. The Backbone.js library gives structure to web applications by providing models, collections and views, all hooked up together with custom events. 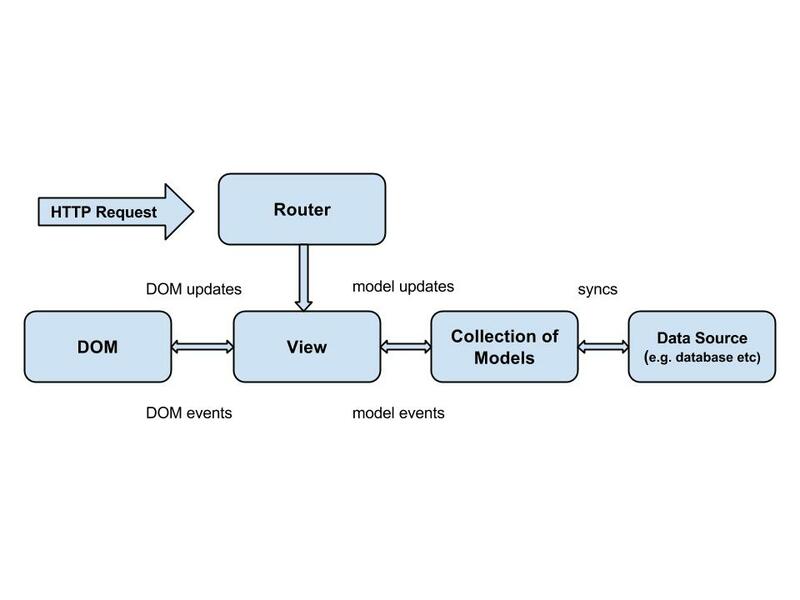 Models represent key value binding and custom events, collections provide rich API functions, views for handling events, which connect the application to backend via RESTful JSON interface and automatically save and fetches the data. Let’s begin with, one by one in detail. Backbone views are responsible for how and what to display from our application. They don’t contain the HTML markup for the application; they provide idea behind the presentation of the model’s data to the user. Views are used to reflect “how your data model looks like”. It has its own DOM element which knows about its model or collection. It handles the user input events and binds the model events and model methods and renders model or collection and interacts with the user. It represents the logical chunk of UI in the DOM i.e. view classes do not know anything about the HTML and CSS. Each view can be updated independently when model changes without reloading the whole page. It allows defining DOM events declaratively without having to worry about render function to the model into HTML using a template data. A view "el" is where all the event binding takes place. You don’t have to use it but if you want backbone to fire events you need to do rendering work on the el. It tells the view which element to use as the view reference, whether they have been already created or not. An "el" is a DOM element and every backbone view has “el” property. The DOM element can be accessed with the el property. Create a view associated with existing DOM element. Create a view which will have its own DOM element. As shown in the script, we are setting view’s “el” property to div id “app_demo” which makes Backbone.View owner of the DOM element. The code binds the container element and any event that we trigger must be in this element. Save this file as el_Property_demo.html. By using models, it is possible to validate the data, store the data, and provide access control to different parts of the data in the application. They contain bunch of data and methods for performing related operations and computations on the particular data. Models are important building blocks for developing backbone.js applications. Model can be created simply by extending the backbone model class. Whenever we create the model, backbone will call initialize function as shown in the above example. This function can be used to add custom behavior to the model. Whenever we create instance of a model, initialize () function get triggered. We can pass parameters to the instance of the model by setting hash of attributes on the model. The value of an attribute can be set by using set () method and get the value of an attribute by calling get () method in the model. In the above script, we have created the model simply by extending the backbone model class. The instance of the model is created by using new keyword. The set () method is used to set the value of an attribute as “Mahantesh” and get () method is used to display the value of an attribute by using alert box. Collection is quite similar to creating model which is ordered set of models. Collections contain list of models that can be processed in the loop and support sorting and filtering. When creating a collection, we can define what type of model that collection is going to have along with instance of properties. Any event triggered on a model, which will also trigger on the collection in the model. As we know, model can be created simply by extending the backbone model class. Whenever we create the model, backbone will call the initialize function as shown in the above script. This function can be used to add custom behavior to the model. Whenever we create instance of a model, initialize () function get triggered. The collection can be created simply by extending the backbone’s collection class. Once we specify the model property of a collection, later on whenever we create this collection, it will create an array of the specified models i.e. it creates array of models song1, song2 and song3 as specified in the code. As shown in the script, add () and remove () methods accept both individual models and list of models. The collection can be created simply by extending the backbone’s collection class and with model name “MyApp”. We are using three variables a, b and c assigning different country name respectively by using model name “MyApp”. First, we are adding a and b which brings up the collection size as 2. Next, by adding the last value c, the collection size will be 3. Adding of items to a collection can be done by the add () method. If you want to remove a and b from the collection, write as “remove [a, b]” which makes size as 1 and lastly after removing the last variable c which makes the collection size 0. The result of all these operations can be seen in console.log of the browser. Router is similar to hook menu which defines paths and callbacks. Backbone routers are used for routing application URLs when using hash (#) tags i.e. it is an URL representation of application’s objects. The URL is changed manually by the user. The URL is used by backbone so that it can understand what application state to be sent or present to the user. Router is required when web applications provide linkable, bookmarkable, and shareable URLs for important locations in the app. The router can link views based on its application state. It is responsible for loading the data and displaying templates. It provides methods for routing client side pages and connecting them to actions and events. When router maps URL, it triggers the actions and events for the matched routes. It is still very useful in providing URL routing facility for an application. In URL routing, anything after hash (#) tag is interpreted by the router. Few years ago, there was no separate URL for each single page applications. The browser was not capable of displaying separate pages for separate screens. In the present situation, the above operations can be handled with single page applications by using backbone routes. When we click on the route 1, route 2 and route 3 and observe the UI changes to the action triggered by the mentioned links. When you click route 1 more than one time, the link seems to not trigger any action. We have created the menu view called “RouteMenu” and trigger router’s reset action each time when clicking on the link. We can call the same route multiple times by clicking the same link. Next, we have created the router model which translates URL requests into actions. The routes configuration is created by using “route/: id”. The line “Backbone.history.start ();” starts backbone history for bookmarkable URLs. When we run the script, we could see the URL is getting changed in the address bar of the browser. Events are the basic inversion of control and capable of binding objects and trigger custom events i.e. we can bind custom events by using desired name of our choice. As shown in the code, we have declared an empty object which can be extended by using underscore functionality called “_.extend” because underscore is backbone’s hard dependency. The _.extend functionality has syntax as, _.extend (destination object, source object).